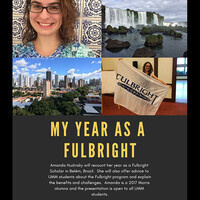 Amanda Hudinsky will recount her year as a Fulbright Scholar in Belém, Brazil. She will also offer advice to UMN Morris students about the Fulbright program and explain the benefits and challenges. Amanda is a 2017 Morris alumna and the presentation is open to all UMN Morris students.